The Equine Lameness Prevention Organization offers various certification opportunities for hoof care professionals. Through the implementation of the E.L.P.O. Certification program, we hope to establish improved consistency and quality of excellence around the E.L.P.O. Hoof Care protocol, as well as promote the highest level of professionalism through our network of members. For many professional farriers and trimmers, the E.L.P.O. Certification represents an achievement towards a better understanding of foot function and bio-mechanics For others, it signifies a specialized adjunct that compliments other certifications and achievements which highlight the necessary skills required to be a well rounded hoof care provider. No matter what your motivation may be, the E.L.P.O. Certification Programs offer the opportunity to learn and develop practical, common sense skills that farriers and trimmers can use on a daily basis to help treat and prevent lameness, as well as improve the overall performance in horses. The Live Sole Hoof Mapping Certification is the first level of certification offered by the Equine Lameness Prevention Organization (E.L.P.O.) and is the basis for all continuing certifications. Earning this certification means that individuals are competent at accurately identifying and exfoliating the foot the functional sole plane, which is the guideline the E.L.P.O. uses for balancing feet. Additionally, one must be able to accurately evaluate hoof distortions and map external references using the E.L.P.O. Hoof Mapping Protocol. Ability to accomplish these tasks successfully and in a timely manner shows proficient skills in basic E.L.P.O. protocol. In addition to the practical exam, participants must also successfully complete a written exam of basic equine and distal limb anatomy, as well as biomechanics and common sense hoof care applications. The Certified Barefoot Trimmer is the second level of certification offered by the Equine Lameness Prevention Organization. Earning this certification means that individuals have shown competency at employing the barefoot trimming guidelines of the E.L.P.O. Participants are able to make accurate assessments of hoof balance and hoof distortions prior to trimming the foot. They must be able to make good decisions about appropriate exfoliation procedures for barefoot horses, and then be able to accurately trim feet to provide a safe, balanced foundation for each horse that meets their needs for support, protection and leverage reduction. Individuals must accomplish these practical skills in a timely manner while maintaining the horses comfort and safety throughout the trimming process. In addition to the practical exam, participants must also successfully complete a written exam of basic equine and distal limb anatomy, as well as bio-mechanics and common sense hoof care applications. The Certified Farrier Practitioner is the third level of certification offered by the Equine Lameness Prevention Organization. Earning this certification means that individuals have shown competency at employing the farrier and shoeing guidelines of the E.L.P.O. Participants are able to make accurate assessments of hoof balance and hoof distortions prior to preparing the foot for shoes. They must be able to make good decisions about exfoliation procedures for shod horses, and then be able to accurately trim feet to provide a safe, balanced foundation for each horse. When applying shoes, participants must be able to make a proper shoe selection that meets the horse’s need for support, protection and leverage reduction for their discipline or use. Individuals must accomplish these practical skills in a timely manner while maintaining the horses comfort and safety throughout the trimming process. Farriers taking this exam must also successfully complete a shoe board that displays their basic blacksmithing skills necessary to meet the most common forging demands of farriers today. The Certified Farrier Practitioner is also a third level of certification offered by the Equine Lameness Prevention Organization. Earning this certification means that individuals have shown competency at employing the farrier and shoeing guidelines of the E.L.P.O. using composite or other "shoe" materials and attaching them to the feet with adhesives rather than nails. 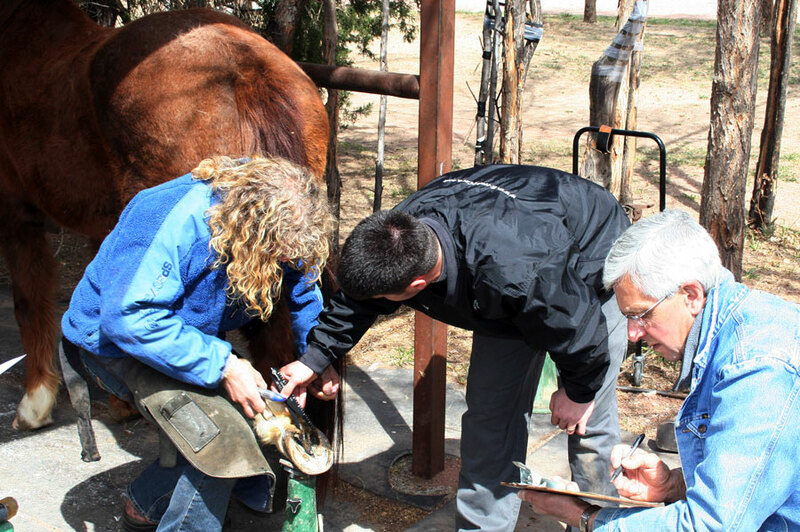 Participants are able to make accurate assessments of hoof balance and hoof distortions prior to preparing the foot for composite shoes and adhesives. They must be able to make good decisions about exfoliation procedures for shod horses, and then be able to accurately trim feet to provide a safe, balanced foundation for each horse. When applying shoes, participants must be able to make a proper shoe selection that meets the horse’s need for support, protection and leverage reduction for their discipline or use. Individuals must accomplish these practical skills in a timely manner while maintaining the horses comfort and safety throughout the trimming process. The Certified Lameness Specialist is the fourth level of certification offered by the Equine Lameness Prevention Organization. Earning this certification means that individuals have shown the ability and aptitude for evaluating the troubleshooting many of the common lameness issues of today. Participants must be able to accurately gather and process important data with regards to locomotion, lameness history, and veterinary diagnostics available. They must then be able to make accurate assessments of hoof balance and hoof distortions prior to preparing the feet for a treatment package. Participants must be able to communicate their assessment of the lameness condition with the veterinarians and horse owner, and develop a plan with all parties involved. They must then be able to make good decisions about exfoliation procedures for shod horses, and then be able to accurately trim feet to provide a safe, balanced foundation for each horse. When applying a treatment package, participants must be able to make proper footwear selection that meets the horse’s need for support, protection and leverage reduction for the condition or symptoms displayed. They must also show the ability to be flexible in their decisions and make adjustments to fine tune the horse’s comfort level during the healing process. Individuals must accomplish these practical skills in a timely manner while maintaining the horses comfort and safety throughout the trimming process. In addition to the practical exam, participants must also successfully complete a written exam of equine and distal limb anatomy, basic veterinary diagnostic endeavors, as well as biomechanics and common sense hoof care applications. Click HERE for more details on the E.L.P.O. Certification program & requirements currently available. Click HERE for a list of Study Guide Materials for the E.L.P.O. Certification programs.